The municipalities of Árborg and Flóahreppur in South Iceland share a rich history, beautiful scenery and a friendly population of 8.817 people. The largest town is Selfoss and about 13 kilometres south of Selfoss are the villages Eyrarbakki and Stokkseyri which are located next to the seashore. The regions and its surrounding areas have endless possibilities for travellers. You may have heard about the Icelandic nature, the culture, the sagas and want to experience all of it. Maybe you are planning a conference or just want a place where you can relax and enjoy the quiet. Look no further for the region has all of this and more. If you are staying in one of the many accommodations available in Árborg and Flóahreppur then there are countless possibilities for trips and tours. You can go on a scenic walk, go bird watching, trips to the seashore, kayaking, horse riding, enjoy beautiful scenery while quad biking or have history brought to life on a historical Saga tour. You can visit one of the many geothermal swimming pools, go fishing or golfing, visit museums, taste the local food, browse all sorts of handcraft or just go for a walk around the area. This is only a fraction of the endless options that await you in the region and its surroundings and if you are wondering how to get around there are car rentals, taxi services, four wheel private tours, bus rentals, scheduled tour buses or public transportation. So don’t wait, pick up the phone or write an e-mail to one of the many travel companies at your disposal. Selfoss Area is your destination! GPS Points N63° 56' 13.254" W21° 0' 23.427"
In the area we have various options of activities for every age group. For example the family could enjoy the magnificent nature while kayaking or go horseback riding. We are really proud of our beautiful scenery. Our amazing surroundings include the beautiful beach, the waterfall Urriðafoss among with other extraordinary natural wonders. We offer numerous options of culture an art. Galleries and museums can be found all around our municipalities. We have a diverse wildlife that’s fun to go and see. Take a walk on the bird reserve or visit a local farm to meet the farm animals. We offer various options of beautiful walking trails. Most of them or quite easy to do and are suitable for almost everyone. Welcome to the old Fish Factory at Eyrarbakki. Accommodation and Youth Hostel open all year and during the summer we open a café as well as a market for utensils and handicrafts, together with a vegetable outlet where we sell the produce of the farmers and fishermen from all over the South Iceland area. Handverksskúrinn at Selfoss offers miscellaneous handcraft such as: Clay, glass, wool textile, quilt, knitting and crochet, jewelry and variety of seasonally related products. Þuríðarbúð was erected in 1949 in memory of Þuríður Einarsdóttir and old working procedures. From 1. May til 30. Sept. open every day: 11.00 -18.00. At other times by arrangement. The Guesthouse Kvöldstjarnan (Evening Star) stands on the rim of the great Þjórsá lava, which the Atlantic Ocean has molded into a shore renowned for its beauty. South accommodation, Suðurgata is a cosy old house for private rent in quiet surroundings situated in Eyrarbakki, which is a historical fishing village only about 40 minutes from Reykjavík by car. Restaurant, bistro, café and pizzaria. Rauda Husid is located in a building built by Guðmunda Nilsen 1919 as a retail shop. The historical and relaxing atmosphere in Rauda húsið welcomes you to enjoy excellent food, such as delicious lobster, seafood, lamb and other dishes, along with good wine and personal service. Fjöruborðið restaurant in the village of Stokkseyri is an enchanted place of delight. People have to tear themselves away from it - but that is all right. There is only positive magic inside, tickling both your stomach and your soul. 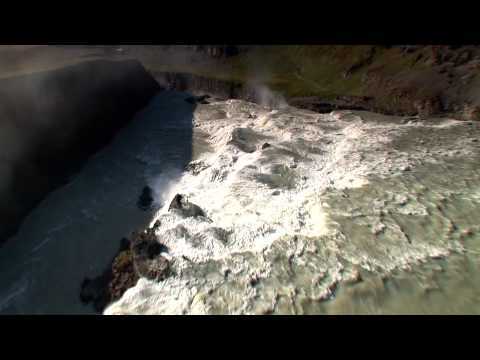 The river is the most voluminous river in Iceland with the average flow of 423 m³/sec. Three large floods occurred in the 20th century and beside the restaurant Tryggvaskáli are lines that show the height of each flood. All the floods occurred during wintertime due to heavy rains and high temperatures which caused the snow to melt unusually fast. Ölfusá River is rather short, about 25 km (14 miles) long. About 6 km (4 mi) north of Selfoss are two rivers, Sogið and Hvítá, and combined they form Ölfusá. Surtsey, Iceland's youngest volcanic island, has been added to the prestigious UNESCO World Heritage list following the World Heritage Committee held in Quebec City on July 7, 2008. "Surtur comes from the South... the hot stars down from Heaven are whirled. Fierce grows the steam and the life-feeding flame, until fire leaps high about Heaven itself." - From the Icelandic poem Völuspá, ca. 950 A.D.
Surtsey is not only one of the world's newest islands, but the most filmed and researched and one of the most restricted. Ever since the eruption in 1963 which heaved it up out of the waters 18km (11 miles) south-west of Heimaey, its progress has been monitored. This has been giving scientists a fascinating insight into how a new island evolves, how flora and fauna develop and so on. Because of this very few people are now allowed to visit the island, and special permits are only granted for scientific research. On the 14th of November, 1963 Icelandic seamen, that were fishing about 20 km southwest of Heimaey ( Vestmannaeyjar ) observed the beginnings of an undersea eruption that originated at a 130 meters depth. When the eruption first occurred, columns of ash were sent almost 9,146m (30,000 ft) into the sky and could be seen on clear days as far away as Reykjavík. An island eventually rose to a height of 169 metres above sea level that had an area of 2,5km². This island was named Surtsey for Surtur, the fire possessing giant of Norse mythology who would set fire to the earth at the Last Judgment. Because of pounding seas, there was a considerable amount of early erosion, but the island core quickly solidified as rock and is now holding its own while scientists watch everything. For three and a half years Surtsey rumbled and lava flowed. Long before the eruption stopped the island was proclaimed a nature preserve and all travel there was restricted to scientist that used this unique opportunity to study the gradual development of life on a sterile landmass. The first living found in the ash deposits close to shore. In May of the same year a fly was found on the island. Sea gulls visited the tide waters furthest from crater. The first vascular plant to flower along the shore was the sea rocket, observed in 1965. By 1987, twenty-five species of higher plants (including tomatoes!!) had been observed, transported there by seed in the sea currents, some from nearby island, other from the southern Icelandic coast 40 kilometres off. Other species of plants have been carried there by yhe winds or birds from Europe. Surtsey is a favorite resting place for migratory birds during seasonal flights to and from Iceland and Europe. They visit there yearly by the thousands. Seals also visit the island and relax on its beaches. Today five species of birds nest on Surtsey: the Herring Gull, the Black Backed Gull, the Black Guillemot, The Kittiwake and Fulmar which was the first species to nest there and hatch its young on the warm lava in 1970. BBC and David Attenborough have produced acclaimed television programs from this amazing little island.